Anonymous Shirdi Sai Devotee From US says: Sai Ram devotees, My humble salutations at my Sai’s feet. Sai, please make me Your instrument to share Your leela amongst the devotees which will help all of us to strengthen faith and patience. 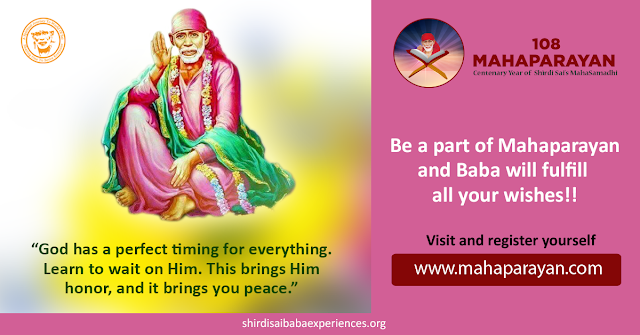 We have to always think of Baba’s core message –Shraddha (faith) and Saburi (patience). What to talk about His leela? When He Himself is planning everything and controlling everything, He alone knows all. This will be a foolish interpretation if I think I am sharing and talking about Sai. He is with you, He is with you, He is with you, He is with you, He is with you, as you at this very moment. He is, its through Him you listen, its because of Him you understand, it is because of Him you speak, it is because of Him you are at a certain place, it is because of Him you fail, it is because of Him you suffer, it is because of Him you gain, it is all Him. He knows exactly because, it is not Him and He is not separate from you, He is actually you and I can say that and I know to you it means only words to some of you who are reading this but I want you to just to have faith in that. Have faith that at this point, from this point on you are not alone you are never alone because, the one that has sent you, the one that has given you this breath, the one that has is with you, He is never, He will never leave you, You are in His lap constantly even while living this life you should never leave His lap and never stop to look for Him. Our sufferings are till we realize that we were just all this time sitting in His lap . Hereby, I offer my writings to Our merciful mother Sai because Sai is the doer of everything. Nothing happens without His will. As we live in this world and there are so many things going on, I would like to share about few instances where Sai took care of everything. It is an injustice to describe His glory just as few miracles. This life is a gift of God, we live because of Him, we breathe and all our organs function because of Him. The nature we see around, the trees, the sky, the animals all are His creation. The world is divine. Unfortunately, we are so much drowned into this worldly illusion that we do not see divinity in everything. As being Sai’s child, I have learnt that the real spirituality is killing all the evil qualities in us and rediscovering the divinity within us. Finally, I have realized that the most important gratitude to Sai is to follow His teachings. I am trying my best to surrender all my problems to Him. It is not only the physical act of surrender but it is the real exercise of feeling let go and let God prevail. I have been praying to Sai to give me immense faith so that I can surrender to Him completely. Because of this attitude in me, I surrendered in the following way. I had pain in foot and it was difficult to walk. Before, I used to think a lot and google and get more worried. This time I surrendered to Baba without worrying much, drank Vibhuti mixed water and I am feeling better with Sai’s grace. We live in US. We are on H1 visa. Our H1 visa expires in a month. Despite we submitted all the required documents on time, we had to face an uncertainty with visa renewal. They needed one more document and there was no way we could submit it earlier. I called my father from my home country to visit to US and He would be returning after 3 months. We are shifting to a new state due to new job, all the furniture ordered, the existing furniture goes for donation and we have already rented a townhouse. We were shattered with visa issue and there was a probability that we might have to return to our home country and renew our visa. My husband was worried a lot. This time I did not worry much. I knew Sai will set all the things right. I had faith that He would take care of everything. I am a house captain of MP group and I have my responsibilities too. I knew Sai knows all my responsibilities and I surrendered this problem to Sai. I persuaded my husband that Sai would take care and we just need Shraddha and Saburi. I felt like this was a test. By His grace, one of the document was submitted on Thursday and seemed like they would review our applications on time. I know Sai has already started working on it. We just need strong faith, total surrender and patience. Sai, please bless me with all these treasures. I am sure we will get our visa as per His timings. My father is visiting us and He is travelling alone. This is his first visit to US. I did not want to worry much, therefore, I surrendered to Sai. Baba arranged an accompany for him during his travel. The transit was too long because of my mistake. Baba arranged an accompany for him and my father could contact me via him. He is landing today and I know my Sai was with him during the entire journey as I had prayed to Him. Devotees, we have problems and it is impossible we can solve our problems and worries. Let us not think about our problems, let us give our problems to God and instead pray to Him. We will be more worried if we think about the problems and it makes the problems more bigger. Let us turn our full attention to Sai and just think about Him and His leela. This will help us. The transit was already long and I was feeling guilty because I booked the ticket. unfortunately the flight got delayed by 2 more hours. I was feeling so bad, sad, and guilty. I could not control my tears. I kept on crying and kept praying to Baba. I don’t know when I slept. After few hours when I checked the status, the flight took off on time. Thank You is a small word, still, I would like to say thank You for everything You do for us. I am trying my best to be strong and live with strength, positivity and gratitude, yet I turned weak and cried. I am sorry my Baba. I know Your love, grace, guidance, power will uplift me and I will learn to surrender totally and leave all the burdens at Your feet. He has come to you today through this experience and He has given a promise that “whoever my eyes are set on, I will transform that person, if you have faith in that one sentence that He has said, you will change, you will die while you are alive and you will live with God.” There is not a single living being that comes without that spark of light. You are with that spark of light and that light is being ignited and you are becoming aware of that light today and if you are becoming aware of that light today, Because God is the only way, God is not in form of worship, God is happiness, God is love, God is peace and God is being , gives you a totally new meaning of respect from the worldly respect meaning. It’s a fullness that you can never experience with any thing or anyone in this life. Swami, please make me capable of following Your teachings in my life. This is my aim of my life. I do not want to hurt You and make You upset. I want to follow Your words. I want to be Your instrument and serve the humanity. I know You have a task for me to do, right now I do not have any idea, but, I know I have to do Your task. You will reveal it in the right time. Till then, I will grow more through practicing Your teachings and live with complete faith, complete surrender and patience. Thank You Sai for being my inspiration, my reason to live, my mother, my friend, my everything. I know I have many negative qualities, Your love is transforming me and will transform me for the better. Allah Malik! Samasta Loka Sukhino Bhavantu (Let everyone in the world remain in peace and happy). When we merge our soul in Baba through complete surrender, His divinity embraces us like nothing else, let us feel the bliss of His blessings in our lives and start counting our blessings and little joys that come our way and let us forget all our worries as they too shall pass, what will remain is His grace and name, so let us hold on tight on Him . Love You Sai. Jai Jai Ho Sai.